Hi everyone. 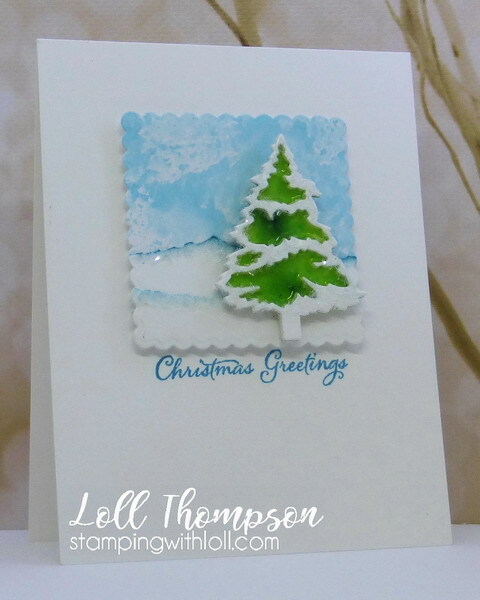 Today I'm sharing a clean and simple card featuring Penny Black's Evergreen Tree die. I started with a small panel of mixed media paper, smooshing with Broken China distress ink and lots of water. Once dry, I layered two pieces of torn which paper for the snow hills (sponged on the edge with more Broken China ink). The snow hills were die-cut with the scalloped square die from "do not open..." die set. The smooshed background was also die-cut with the scalloped square and the snow hills were adhered on top, lining up the edges. Another small panel of mixed media paper was smooshed with two shades of green Brushos. Once dry, the largest tree in the set was die-cut. The top layer of the snow tree was die-cut from white card stock four times, adhered together and glued to the backing with the green Brushos. Crystal Glaze was added to the recessed areas (green) and left to dry. This give the tree a stained glass look. More Crystal Glaze was added to the top of the snow hills and all over the snowy part of the tree, then both all were sprinkled with diamond dust. Once dry, the scalloped square was popped up on foam onto the card base. The tree was popped up on top of the scalloped square for more dimension. A sentiment was stamped underneath the square using Broken Glass. If you get a chance, pop over to the Simplicity at it's best blog to see some new designs from my Simplicity Sisters. I'm entering this card into Simon Says Stamp Wednesday Challenge - Baby It's Cold Outside. Beautiful card Lol! I was wondering, is Crystal Glaze better than Glossy Accents? Lovely tree with the Crystal Glaze (I think it has more shine than the Glossy Accents so I've ordered some). Beautiful snowy hills and blue sky! Love, love, love this shiny, snowy tree, Loll! The green is so bright and pretty and the glaze makes me think of glass candy! Lovely background too! I love the icy look you gave your tree with the crystal glaze as well as the sparkle from the diamond dust. You also achieved a remarkably clear impression on your sentiment using distress ink. Your soft blue makes such a beautiful background and did love the unique way you created the snow drifts. Wow Loll, what an amazing card, and the mini-scene is full of detail and dimension! Beautiful, just beautiful, Loll. Shiny and sparkly, too. Love it! What a great card, Loll. I love the layers and dimension and the card just sparkles and shines. I love that tree! Such a cute little square of wonderful mixed media elements. The smooshing looks so pretty and the die cut hills are fabulous. The little tree just pops and looks glorious and super shiny. Nice finish with the bling on the snow hills and the snowy parts of the tree. Petite and beautiful CAS card whilst mixing the medias.....I love it x. Another beauty, Loll, and thanks for the close up which so perfectly showcases all that sparkle and shine! Another gorgeous Christmas card, Loll! Your sky background is beautiful and I love how you added sparkle and shine to the snowy hills and tree! I also love that you chose the scalloped square for your focal point...it's so pretty! Oh, wow! What a gorgeous card with the lovely snow scene and tree! 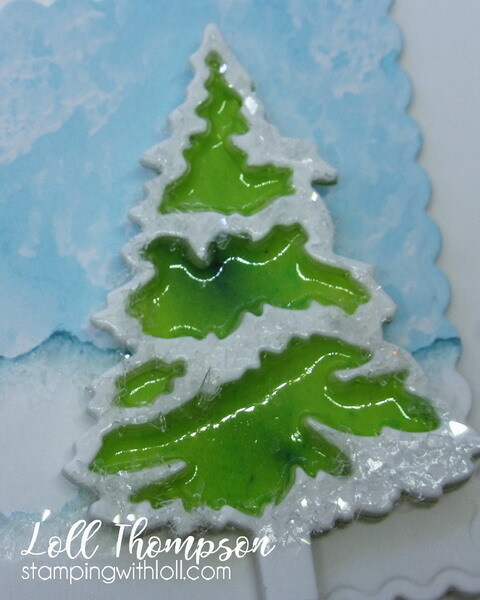 Fabulous crystal glaze on the tree, super lovely!! What a sparkly and shiny winter scene, Loll! The DI smooshed sky and the faux-stained-glass tree are so pretty! I admire your great attention to detail. Love the design elements of your card Loll, especially your stained glass tree. Swooning friend!! I can almost feel the frosty air!! wow, what details...looks amazing mf. It's another amazing project, Loll! I love this beautiful stained-glass tree, a great idea to do it. And I love your beautiful blue and snow-covered background.